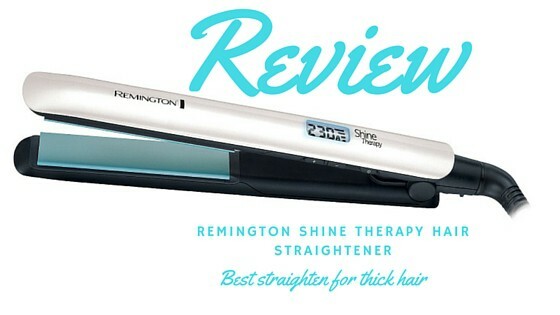 Remington S8500 Moroccan Oil Shine Therapy Hair Straightener: Best Hair Straightener For Thick Hair ? Many people are saying that the Remington S8500 Moroccan Oil Shine Therapy Straightener might be the best hair straightener for thick hair. But is it? Let’s find out! Right from the start Remington S8500 Moroccan Oil Shine Therapy Straightener comes with a great professional design. It looks a lot better than other models and the fact that it’s a Remington speaks a lot about the quality you will receive with this product. The visuals are very good and the attention to detail is quite extraordinary which we like a lot. You will also note the fact that this product comes with an oil shine therapy integrated within it. Honestly the device manages to deliver a very good value and that on its own can be very rewarding. This product also considers the safety factor as it comes with auto switch off mode that after 60 minutes with no use they will just automatically switch off to prevent the worry of it causing a fire, especially if you are worried you have left the house without switching it off. The product also comes with a digital temperature display that makes its use very professional and easy to use, as it shows you the exact temperature you would like to choose for your hair type. The heating process is also fast (only 15 seconds) and very reliable but in the end this is what we’re aiming for quick and easy hair straightening. Another thing to note is that the Remington S8500 Moroccan Oil Shine Therapy Straightener doesn’t damage your hair at all. It features a very good hair protection that does wonders in this regard. Glossy locks are 86% more likely with the Remington Shine Therapy hair straightener, according to their tests, and we’re pleased to report that hair will shine like never before with these professional straighteners that you can also use to curl your hair too. 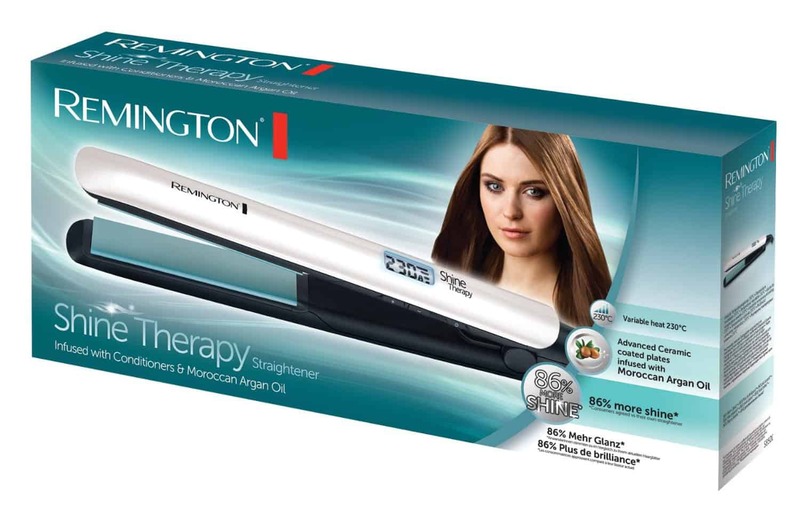 A person that uses hair straighteners often will also see that the Remington S8500 Moroccan Oil Shine Therapy Straightener is very easy to use. It’s not a heavy product and it can actually be considered as lightweight by some. Sure, it might not be a travel unit but it’s a very good one and in the end it’s an amazing tool to use. The coated plates are professional and the results you get are nothing short of impressive. They help you generate the boost and quality that you want. In the end, the straightening experience is a great one and that’s what matters the most. Another great plus for these straighteners is that there are nine different temperature settings, so you can tailor this tool exactly for your hair needs. The temperatures range from 150 – 230°C, and it must be noted that the hotter the straightener it doesn’t necessarily mean better results. For hair that’s more sensitized/damaged use lower temperatures, or for thicker hair that needs a boost, dial the temperature up for smooth results that last from morning to night. I have very thick coarse curly hair, so finding the right straighteners is quite a big ordeal. After my Cloud 9 straighteners broke, I couldn't invest in another pair the same price, or another top of the range pair of straighteners like GHD's. After doing a bit of research, and being persuaded by the price on Amazon, I decided to give these straighteners a go. I'm really pleased with the results and find them exceptional value for money. The plates give a really smooth finish to my hair, which is very impressive considering how coarse my hair is. But much better of all, the time it takes to get my hair straight, and the amount of repetition needed to achieve this finish is the same (if not quicker) than Cloud 9's or GHDs, which I've had both before. The temperature control is really great as well, and the casing it comes with doubles up as a heat protective pad. The plates take a while to heat up to the temperature compared to GHD's and other top end hair straighteners, but for the price that is to be expected. Where this product is let down is by the shape; they aren't suitable to double up as curling Iron's like GHDs or Cloud 9's, and they are quite a bit heavier. The only other criticism I have is that they aren't as good at doing thicker sections of hair at a time, but this is only really a problem if you have really thick hair like me. Overall If you are looking for a styler that achieves poker straight or slightly more bodied hair, the Remington s8500 straighteners achieves a finish that are just as good, if not better, than GHD's or Cloud 9's. With this amazing product being under most people budget at £32.99 this is an absolute bargain on amazon. It comes complete with a heatproof pouch, an on-off indicator and a safety lock. The straightener has worldwide voltage, so you can maintain your style routine wherever you are in the world. As a whole, Remington S8500 Moroccan Oil Shine Therapy Straightener is maybe the best hair straightener for thick hair. It offers a great set of tools, stellar control, fast heat up as well as all the other features you might need from a good straightener. It’s a great investment for sure!